I'm so proud of Riley's early learning skills, for she has already mastered her alphabet, shapes and colors at two and a half years old. But like most kids, her math skills could definitely use some work. Her father and I are always trying to count with her on a daily basis and recite her numbers along with her, but this is an area where Riley is struggling somewhat. That's why I was so happy to have the chance to review the Let's Tackle Math! Patterning and Sequencing Set from Learning Resources. Keep reading to learn more about the toy that could sharpen your child's basic math skills this summer! 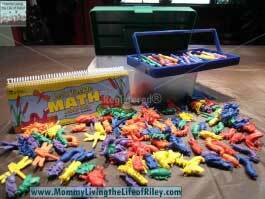 I reviewed the Let's Tackle Math! Patterning and Sequencing Setfrom Learning Resources, which retails for $59.99, but is currently on sale for $40.71 with FREE SHIPPING. Let's Tackle Math! Patterning and Sequencing Set from Learning Resources is a cute, summer-themed powerhouse of fun for children ages 3 to 7. This set contains 252 worm, frog and bug figurines in 6 different colors as well as a 25-page activity book for your child to work through. Depending on the skill set level of the child, you can work through these 48 activities with them or allow them to work through the activities alone. The activity book already contains all of the answers at the back, so that the child can check their own answers independently. There are so many different lessons possible with the Let's Tackle Math! Patterning and Sequencing Set which go above and beyond those included in the activity book. For instance, parents can use the animals to teach colors, counting, sorting and patterns on their own. I plan on teaching Riley to eventually be able to count ALL of the animals in her tacklebox...up to 252! It would also be fun for parents to make a longer, more complicated sequence on the floor using the animals provided and try to have the child decode what should come next. You could also flip the roles of teacher and student and let the child invent the sequence for the parent to decode. If there's one thing I've learned while being a school teacher, it's that sometimes children learn best while trying to teach a concept to someone else. Because Riley is still a little young for this set, we started slow and worked on grouping the items together. First, we grouped all of the worms together and then sorted that group by color and by size. Next, we grouped the other animals together and sorted each by color and then practiced counting them. 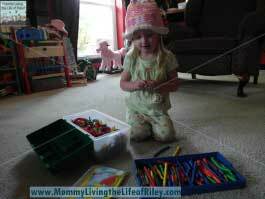 I was amazed at how much fun Riley was having, just from sorting and grouping. At times, she would get a little frustrated when asked to decode the sequence, but with a little more help and encouragement from me, we managed to successfully get through 3 of the activities at one sitting. One of the best features of the Let's Tackle Math! Patterning and Sequencing Set is the actual design of the tackle box, activity book and top tray. 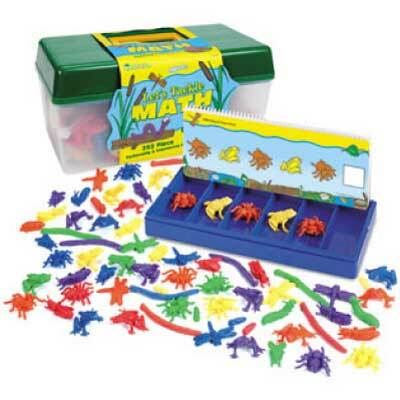 The tackle box serves as a quick and easy way to keep all of the materials together, which is especially handy since there are 252 animals included! The activity book is a spiral-bound freestanding book which works in conjunction with the tackle box's tray. The child matches the correct animal to the activity on the page and places it in the corresponding slot on the tray. Ingenious! 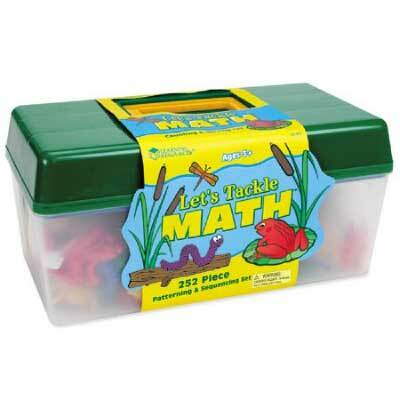 Disclosure: I received the Let's Tackle Math! Patterning and Sequencing Set from Learning Resources in order to facilitate my review. No other compensation was received. This product review is based on my own personal experiences with this item and is completely honest and objective.